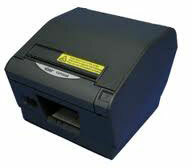 Star TSP800II - Thermal, Friction, 2 Color, Cutter/Tear bar, Ethernet (LAN), Gray, External Power supply Included, Paper Lock. Interface cables not included. See accessories. Also known as TSP847IIE2-24 GRY RX-US. The Star TSP800II is a revolutionary wide-format POS printer that provides a solution to a number of applications where no POS printer was able to before. From compact web printing to mobile transportation printing as well as producing wide high-quality POS receipts with professional and crisp graphics, the TSP800II is the solution! The TSP800II is the only printer on the market that provides printing on 3" to 4.4" wide paper at an amazing speed. It is the perfect printer for applications that need to print a large amount of information on a receipt. The TSP800II features tear bar and auto-cutter options and a choice of Serial, Parallel, USB, Ethernet, or Wi-Fi interfaces. Paper, 82.5 MM (3") Thermal Receipt Paper. Also known as TRF-3. The Star 39444530 is also known as Star Micronics	39444530	.